Early on Saturday morning we stopped in Moore, Oklahoma for breakfast and to stretch our legs. We split up for breakfast at different places and the kids dined at McDonald’s and the Waffle House. We were soon on the road to continue our trek south. Our lunch stop was in Waco, TX, where we all noticed that the air is much warmer in Texas than we Minnesotans are accustomed to. The next break was at a Walmart just north of San Antonio, so that the chaperones could pick up some fruit and milk for our upcoming meals. (The bus thermometer showed the outside air temperature at an unbelievable 112F. By the time the chaperones finished stowing the groceries, it was much more belieivable.) Then it was a quick drive into downtown San Antonio to find our hotel, the Marriott Riverwalk. We checked in and were happy to have arrived at our home for the next six days. 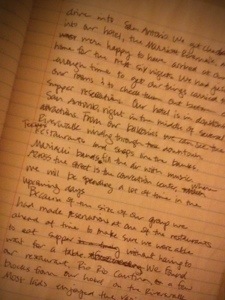 We had just enough time to get our things carried to our rooms and to check them out before our supper reservations. Our hotel is in downtown San Antonio, right by several attractions. 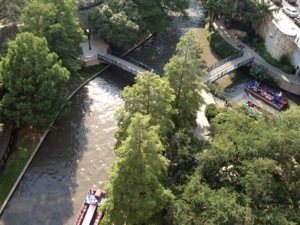 From our balconies we can see the Riverwalk winding through downtown. Tex-Mex restaurants and shops line the banks. Mariachi bands and rowdy boat riders fill the air with music and laughter. Across the street is the convention center, where we will be spending quite a bit of time once the Gathering begins. Because of the size of our group, we had made reservations at Rio Rio Cantina, a Tex Mex restaurant on the Riverwalk. The kids feasted on a variety of enchiladas, tacos, burritos, and other yummy food. We strolled back along the river to the Marriott as the kids pointed out other things they wanted to do in the next week. We gathered in one of our larger hotel rooms to go over logistics and reminders. By the time we were finished, most were ready to fall asleep on a real bed. The Grace youth joined the Rochester group, with whom we are traveling, for a sending service at RCLS. Kids waited anxiously, comparing the sizes of their suitcases, while parents and chaperons went over last minute details. We met in the gym for an enthusiastic sending service led by Pastor Vollrath from Eyota. And then it was time for the bus. What can be said about an overnight bus ride? After a few hours, the excitement and newness of being on a coach bus has mostly worn off, and people start noticing that the once comfortable seats aren’t nearly as big as they used to seem. Soon after one has finally fallen asleep, something will inevitably happen to rouse you from that sleep, like a dropped water bottle, 3am fueling stop, or a restless seatmate. Unless, you are Carolyn, who slept for a reported ten hours, well beyond the average range of sleep for the evening. Insanely busy, super active and going from the time we’re up until lights out. We’ll write more about today later, but it was rainstorms, water park, family group time, big group meet up and then the day was over. Safe and sound. We’ve checked in, shared the evening meal in our Grace group, made plans and retired for the evening. More news after we recover from the bus ride… For now, here a nice picture from one our hotel room windows. 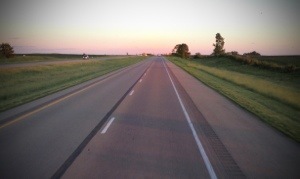 Bags packed, buses loaded, sending service completed, wide open highway ahead, Rochester falling behind. We are settling in for the journey ahead.